Never imagine that I'll got mine too. Thank GOD I have very dear friends like Wafa and Shilpz. When Wafa told me that she has sent the autograph to me I was like jumping around. 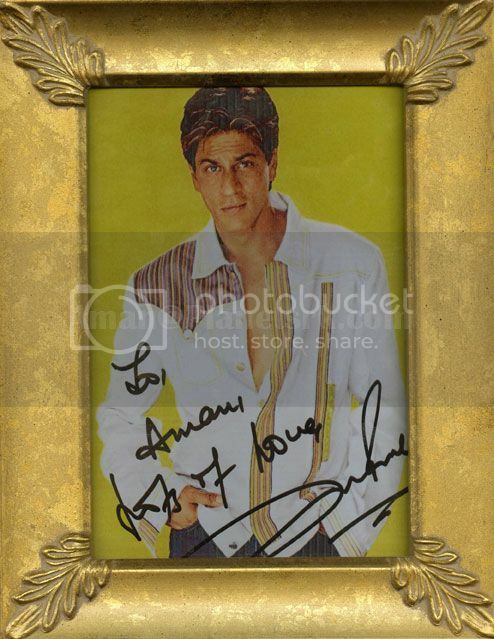 OMG...Shahrukh's autograph!!! That's too with my name on it!!! But I became hopeless when I still didnt receive it coz that time has been a month since Wafa sent it to me. I thought there's people who worked at the airport and love Shahrukh too found the autograph and brought it to their home. Silly thought I know. And then...finally...after 2 months...it's arrived!!! You cant imagine how I felt. I bought the frame only 3 days after I got it. Well...here's the autograph, not too clear, I took it with mobile coz I dont wanna scratch the pic if I'm using scanner. Please...please...please...share the autograph you have with us. Anisa, you could post yours here. wow nattu I am so glad to see you this happy. yes pakiza and all the others please share your autographed pics here..
aman? pakiza? and I will also post mine kal inshaAllah. Will post it tomorrow as well. This is soooo cute!!! I'm really happy for u!! I love it! unfortunately I dont have any ...but i'm looking forward to see all those lucky people who have it! Lol. I know you are Han. Hey...why dont you post his signature on Loves Unlimited book here? Ok Ast...InsyaAllah I will post mine too. ok, here's mine. i bought the making of asoka book, and when i opened it, i almost had a heart attack, because it was not advertised as autographed! U're so lucky, Ast. btw, it looks more clear. I can see clearly the sign and your name here. but of course if i want to see more clear, i have to go to your home, right? I did hav ean autograph...but I gave that to a dear friend..
he had an army officiers suit on. Thanks for sharing Joelette. May I know where did you buy the book? I wanna buy it too. I cant find it anywhere. If you have link or site, please PM me. Thanks. Good choice for the frame Aman. this is fab yaar! really love this one! U r a lucky guy Aman!